This post, with an interesting look at Acchi Kochi, GJ-Bu (which was a guilty pleasure for me as I watched it – felt so dirty with the constant ‘good-natured’ teasing of Kyouya) and Servant x Service also happened to link to a post I wrote some years back about how I’ve been bothered at how “slice of life” has been appropriated in describing shows. And I’m still bothered at what I think is a misuse of the concept, but it helps that I’ve heard the term used in those troublesome ways less than before. Besides that, it’s a good look at back at where I’ve been. You know, when I still had more free time than I have now and better Internet to watch anime compared to now. I’m still trying though, as I’ve caught up to the silly clothing times of Kill La Kill, catching up to Adventurers living in the Database at Log Horizon, and trying to meet up with the continuation of Saki: The Nationals to see Hisa work out her own little bouts of nervousness to go back to being her awesome self. And dm00 picks up the slack by watching all of the shows that I want to see, but don’t have the time to (For serious). And I’ve still gotten out to enjoy anime-related things outside of my home, from continuing to go to cons to experience things (Otakon 2013 was awesome for a variety of reasons, with Piano Me awesomely taking the cake) to watching the third Madoka Magica movie (my thoughts are that the ending makes sense given what we know about the characters. 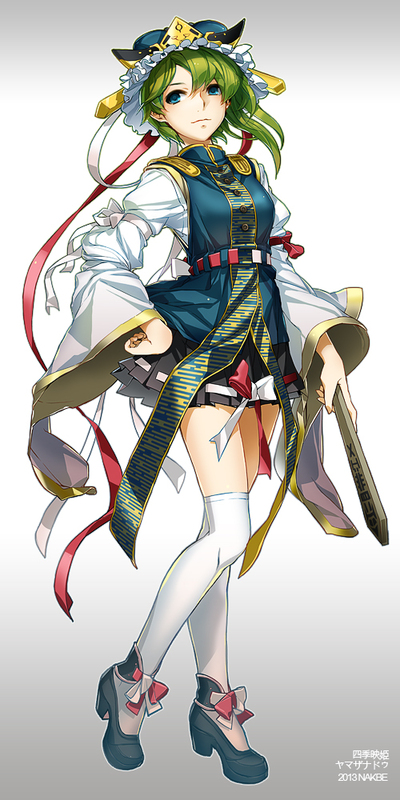 But still, DAMN YOU UROBUCHI!!!! I should have known better!). I’m hoping the trend continues in a couple of days, weather permitting, by visiting Katsucon for fun. Seven years spontaneously writing on this blog is a long time in plenty of ways, but I don’t feel like I’ve matured in a lot of ways since I’ve let the blog slip while concentrating on other important things (ones that others would say matter more). Maybe I guess that’s why I don’t feel the age quite as much this year. Like always, I’ll attempt to drop some posts here and there throughout this coming year, and I’m hoping dm00 and others would be willing to drop some thoughts of their own here as well about anime. It’s a good time of flux. So yay, seven year anniversary! “It takes a while to get used to.” – Clarisse, on many things the characters face in this show. 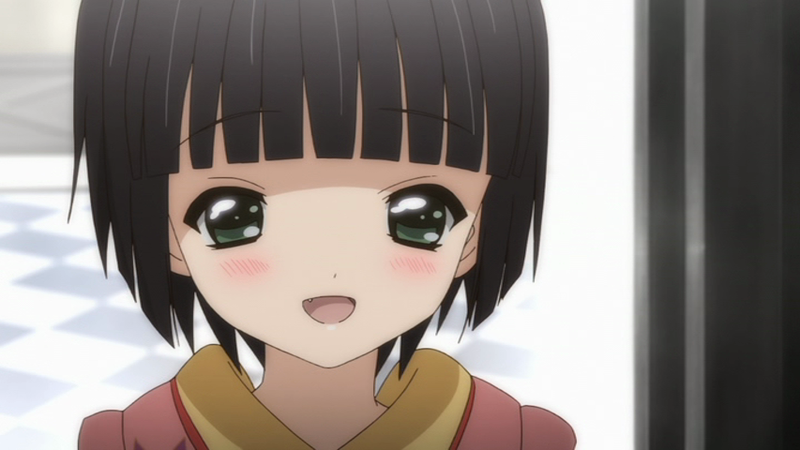 The first thing I thought about the show after the first episode was that Yune was a pretty brave person. The main character of Croisée in a Foreign Labyrinth, her story begins in Paris, France in the 19th century after what seems to be tagging along with a French traveller, Oscar Claudel, in his journey from Japan in order to help out at his grandson’s ironwork shop. Why this happens, how it happens, and what Yune aimed to do weren’t being listed, and barely glossed over during the course of the show (other than Yune’s helping out seemed to be more like being a maid than anything else), because that apparently is not the point. Rather, our goal is to see Yune, and Oscar’s grandson Claude, try to start to make sense of different cultures (Yune’s Nagasaki heritage vs Claude’s middle-class upbringing in a turn of the century France) as she does what apparently amounts to a homestay at that point in time. One of the things that was endearing to me about her was her willingness to go full throttle with trying to understand a new culture and a new country. Things noticed include initially finding out how much she prepared for this trip in the first episode language-wise, or her struggles later on in trying to become tolerant of some idiosyncratic food (lol cheese) to help prepare meals for her housemates better. As someone who’s fairly hesitant to abruptly change things, as well as someone only having been outside of his country once years before with family in tow, Yune’s courage was impressive. And adorable. Her courage was adorable. 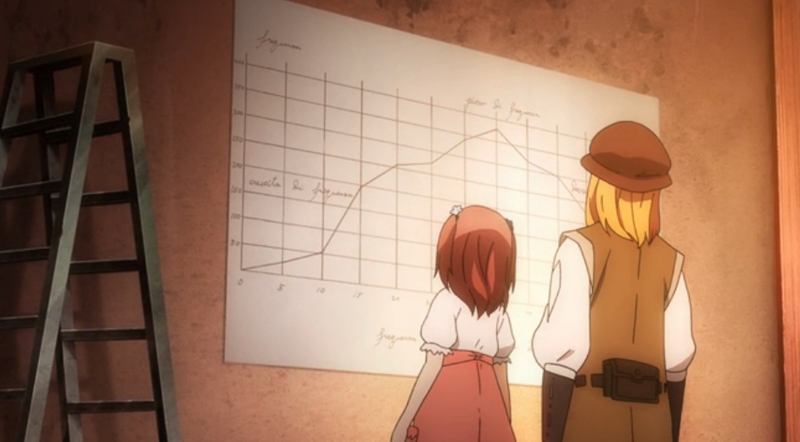 In episode nine of Galilei Donna, Hozuki travels back in time (it turns out goldfish are baited with wormholes) and meets Galileo, who has not only pioneered flight a couple of centuries early, but who has even invented statistical graphics a couple of centuries before Playfair. I think the creators of this series have confused him with the inconveniently childless Leonardo Davinci. Sometimes I think I’m really only watching this series for Kazuki’s pageboy. They’ve been printing Wandering Son, works by Moto Hagio, and will be bringing out Inio Asano’s Nijigahara Holograph. 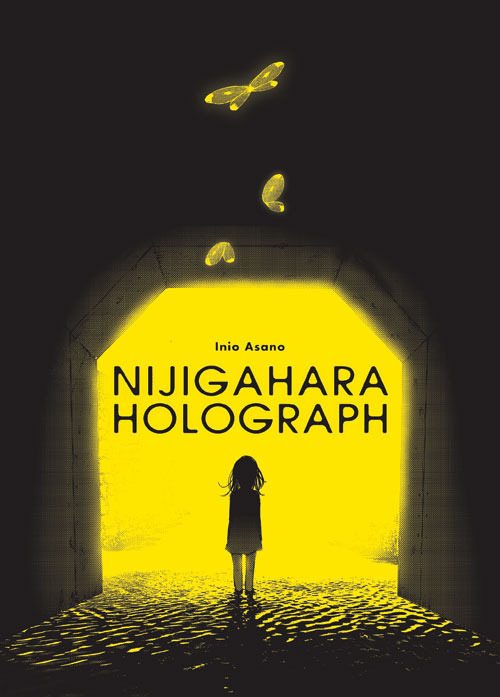 Wandering Son and Nijigahara Holograph may be pre-ordered as premiums on this Kick-starter.